The Listing Worksheet is the main driver for showings. Without basic showing instructions, showings cannot take place. When a listing worksheet has been properly configured it requires minimal updates and provides a solid basis for how showings will take place. Allow Showing Agents to Request Appts Online? This switch controls any & all forms of online scheduling, including appointment scheduling through the MLS and any 3rd party integrations. Permission must be obtained from ANY of the designated listing contacts (Owner(s)/ Occupant(s)/ Listing Agent(s)) before the appointment request can be confirmed. Typically used for occupied homes. Appointment requests are documented and immediately confirmed. 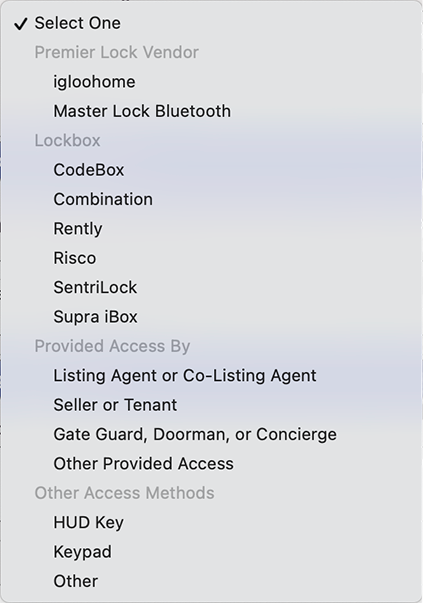 Typically used for vacant homes on lockbox. The showing agent will immediately see any notes provided by the listing agent. The showing agent will not be given a calendar to select an appointment date & time. Note: The ability to switch between feedback templates is available in select markets. Is this an agent Accompanied Showing? This switch controls whether or not agents have an opportunity to confirm or decline appointments prior to an owner or occupant. Note: Accompanied Showings is an optional feature. This setting may not appear on your Listing Worksheet. This switch controls whether or not Spanish speaking staff will be needed to handle appointment requests. This switch controls whether or not the property is occupied or vacant. Information provided will not be shared with showing agents. This switch controls whether or not feedback is sent to agents who have shown this listing. If this is set to No then agents will not be sent a feedback request after showing this listing. This switch controls whether or not push notifications will be sent to anyone associated with this listing. For this to work you will have to have the switch set to Yes and you, your seller, and any associated occupants will need to have the ShowingTime App installed on their mobile device. Setting this option to No will opt everyone associated with this listing from this notification type. As a reminder, individual contact push notifications can be managed from the ShowingTime App. Advanced notifications alert selected listing contacts when an appointment request is in danger of being missed, declined, or cancelled. Allows you to add a Co-Listing Agent to your listing. Agents will only be available if they are located in the same office. Allows you to add a Seller or Tenant to the listing. 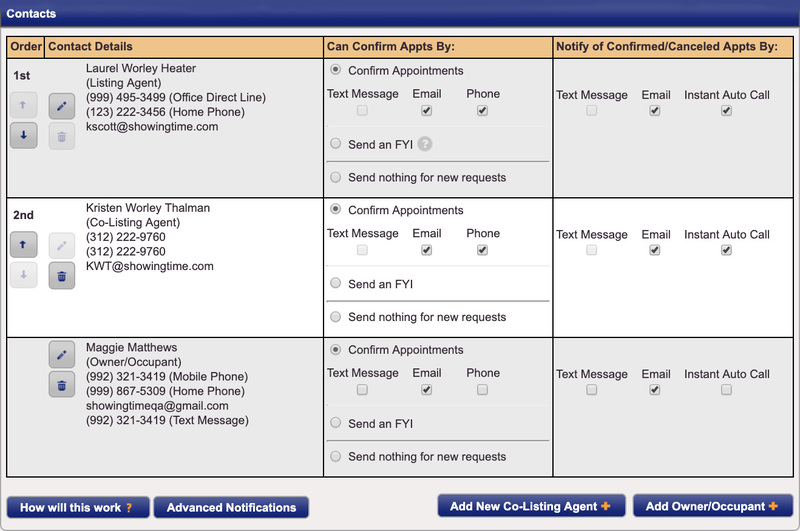 This section allows you to configure any contacts method of notification when appointments are scheduled. This option is only available when the appointment type Appointment Required is selected. This section allows you to configure any contacts method of notification when appointments have been confirmed or cancelled. Appointments cannot be scheduled on the same day. This is the ideal solution for tenant occupied listings or for instances where there needs to be previous day notice for appointments. Required is a lead time which will prevent appointments from being scheduled if the requested appointment falls within that lead time. Suggested is a lead time which will allow appointments to be scheduled. Agents that schedule will be notified that the owner or occupant prefers the time set but it will not inhibit appointments from being requested if the requested time falls within that lead time. Maximum Appointment Window that you would like agents to schedule. Please be aware that if the option has been set to None, agents will be open to schedule appointments which may seem abnormally long as agents view the length of the appointments in two ways, as a time frame for a showing or as an appointment arrival window. Please go to the section below for more information. Access & Alarm information will only be provided to agents when an appointment has been confirmed or if the appointment type has been set to View Instructions Only. Access information will only be provided to agents when an appointment has been confirmed. Options populated are specific to the access type selected. The code needed to disarm the alarm system. Even if the disarm code is the same as the arm code please add it here. The code needed to arm the alarm system. Even if the arm code is the same as the disarm code please add it here. If no code has been added agents will assume that they don't need to rearm the alarm system when leaving. The verbal code needed in-case of accidental alarm tripping. Usually used for location of the Alarm or any specific instructions pertaining to the alarm system. Any notes that you would like provided to the showing agent "after" the appointment has been confirmed or provided automatically if the appointment type View Instructions Only has been selected. A selection of commonly used notes, ranging from notes about showing restrictions, appointment windows or notice and notes associated with pets, access information, or general listing information. Notes can easily be added by selecting the checkbox next to the note. Once all needed notes have been toggled click on Add to populate the notes to that desired section.